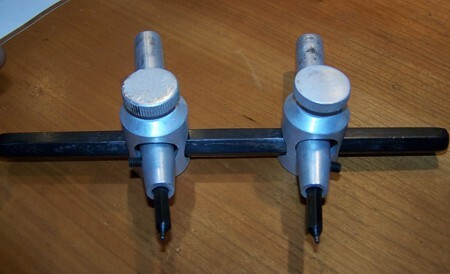 Be aware that most optics are delicate objects, so know your own skills before starting to unscrew. Most hand held binoculars are well sealed and glued together. Cleaning a 6 x 30 can only be done by very specialized companies and this is expensive. Keep this in mind next time you see an Afrikacorps 6 x 30, of which the Ebay-seller states: "Needs some cleaning, which should be easy". Also you have to consider what is best to do in case of a defect, cloudy lenses or heavy fungus gemanicus. Do you leave it as it is, unopened, so original, but broken and dirty, or will a repair benefit the entire status of the item. If you see your piece as an investment for a rainy day, we advise you to leave it as it is. A normal toolset will do in most cases. However there are some special tools you may find useful. 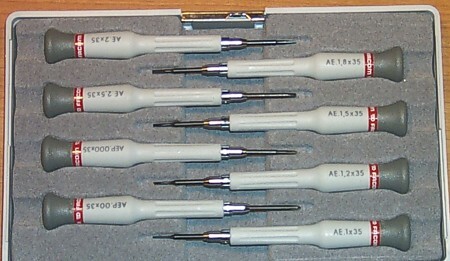 A precision screwdriver set is needed to remove the tiny locking screws. For unscrewing or adjusting the lenses this spanner might be helpful. 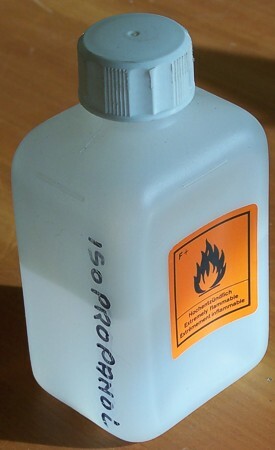 For cleaning the glasswork you can use this fine juice, called isopropanol. Polish the glass with a cheese cloth until the crystal starts to squak! 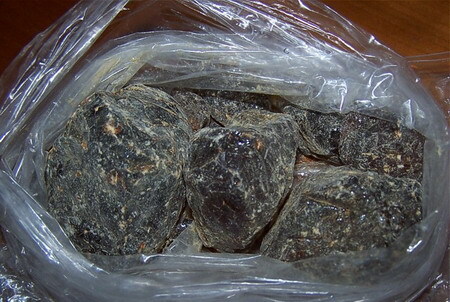 There is a sort of fungus that actualy consumes the minerals in the hard crystal. These traces are hard to remove completely. Keep in mind that irregularities on lenses close to the eye are more disturbing than spots on glass further on in the optics. A carefull airblow will remove all small loose pixels, such as dust. Some prisms have more than one part. They are glued together with a natural resin, today know as Canada balsam. You can buy the resin in a solid state and make it to a glue with a solvent called Xylene. In the liquid state it might be available as Entalan, but you can keep this "beverage" only for a few weeks. Detailed information can be found in the Archive section of this website. 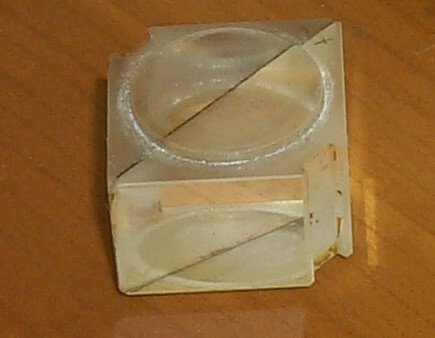 In time the contact surfaces can become unclear, so you have to disconnect the parts, clean and glue them together again. For disconnecting the parts you can simply use a frying pan in which you increase the temperature of the fat very slowly.